Directed by ASU English faculty members Jessica Early and Christina Saidy, the Girls Writing Science project hosts ethnically and linguistically diverse girls in grades 9-12 to examine the roles of women in the sciences, provide female role models and improve the students' science writing. "They don't see that it's possible and are quick to judge, but I've never been hurt or discouraged by it," Castro said. "Science gives a deeper understanding and meaning about life in general. It's interesting to find there's more out there than just what we see." Of ASU Preparatory Academy's class of 2015 – the charter school's first graduating class of seniors – 98 percent are graduating and 76 percent have been accepted to four-year colleges. It marks a stunning turnaround. Sharon Osorno is ready to graduate from ASU Preparatory Academy on May 28. When she started four years ago, she wasn’t sure she would be prepared for the tough academic curriculum. Osorno joins 130 of her peers, 98 percent of ASU Prep’s class of 2015, as a part of the high school’s first graduating class of seniors. 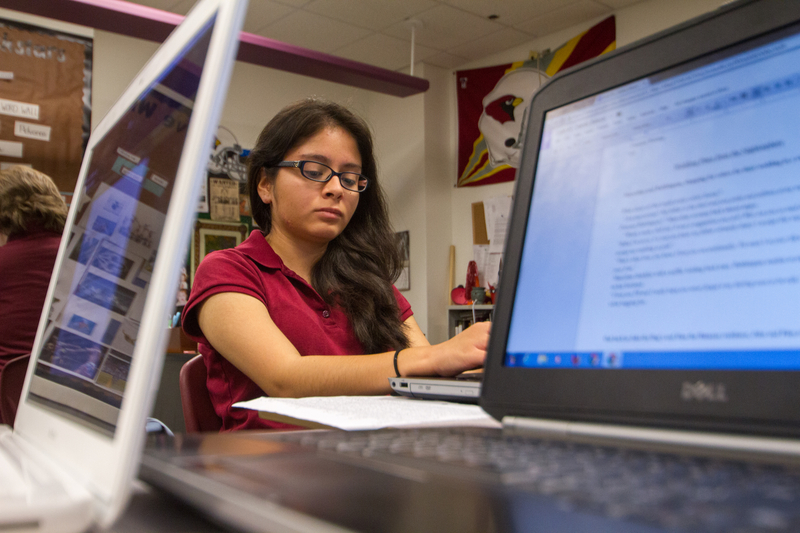 Their success is the culmination of four years of work by students, families, teachers, administrators and Arizona State University to build a rigorous high school program at two schools. The class of 2015 reflects a stunning turnaround for the once-struggling community school in downtown Phoenix and sustained growth and achievement at ASU Prep Polytechnic since the university took over both campuses in 2010. The downtown Phoenix campus had a history of high student and teacher turnover and low academic results. The Phoenix Elementary School District agreed to partner with ASU to rebuild the school’s academic programs for K-12 students. ASU combined operations at the school in downtown Phoenix with its existing school at the Polytechnic campus to create the ASU Preparatory Academy, a free public charter school that serves students in grades K-12. Deborah Gonzalez, the chief academic officer at both schools, has been with ASU Prep since the beginning and helped guide the transition for both campuses. “We saw this as an opportunity to build a school that empowers students to contribute locally and compete globally,” Gonzalez said. Gonzalez’s first challenge was developing a curriculum for two schools that serve widely different student populations. Seventy-six percent of students from the Phoenix campus qualify for free and reduced-cost lunch, while the Polytechnic campus served a more affluent neighborhood. Gonzalez worked with teachers, site administrators and parents to implement a unique curriculum at both schools that focuses on academic preparation, community connection and global awareness for students in high school and beyond. ASU Prep’s curriculum is modeled after the internationally acclaimed Cambridge curriculum. Teachers at ASU Prep are all experts in the subjects they teach; 70 percent hold or are completing advanced degrees. In addition, juniors and seniors are eligible to take ASU courses for college credit. All students have the opportunity to participate in an annual capstone project, where students take knowledge learned in the classroom and use it to benefit the community. Jeni McClue, a chemistry teacher at ASU Prep, oversees a capstone where high school seniors tutor and mentor elementary students. She sees firsthand the impact ASU Prep students have on the surrounding area. The commitment to ASU Prep extends beyond to parents as well. Many parents play an active role in personalizing the curriculum for their children, offering feedback to teachers and administrators. And parents are required to give 30 hours of service to the school. They volunteer in classrooms and support extracurricular events. Olga Martinez, a parent who voluntarily teaches Spanish to teachers, believes ASU Prep is helping her children. 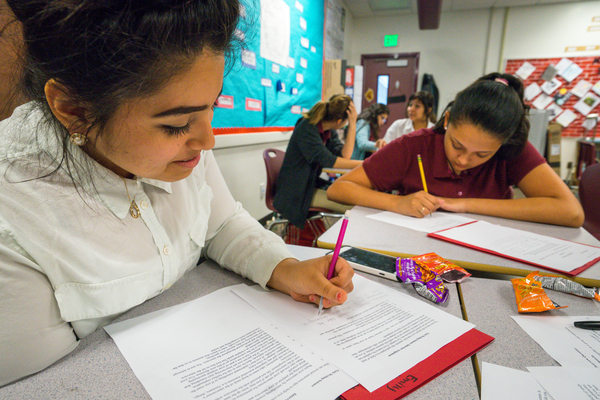 The unified rigorous curriculum is paying off for students. The National Charter School Association recognized ASU Prep as one of the best schools based on academic achievement. On the statewide AIMS test, ASU Prep students at both campuses beat the statewide average for gains in math scores and gains in reading scores. The focus on college readiness contributed to a high college acceptance rate. The class of 2015 will send 76 percent of students to a four-year university; 72 percent of students were accepted to Arizona State University itself. Students in the class of 2015 earned more than $2 million in scholarship money. For Osorno, ASU Prep helped prepare her to excel in college. She will be the first in her family to attend college when she attends Arizona State University to study biochemistry in the fall – an accomplishment she attributes to her teachers at ASU Prep.